Recently the Victorian Smart program set to roll out time of use pricing for smart meters has been put on hold, citing reasons of price increases affecting pensioners and other groups. This hasn't stopped the energy companies moving ahead and charging us for the smart meter we may never get, and the energy company must be as happy as bankers. I called in to visit my father this morning to let him know his SEGmeter will soon be ready, and he told me about the problem he's been having with Origin energy's mart meter charges. You see, he's being billed $27.15 per month, $325 a year or over 5 years $1630 - for a meter that won't help save energy, and may or may not be installed any time soon. 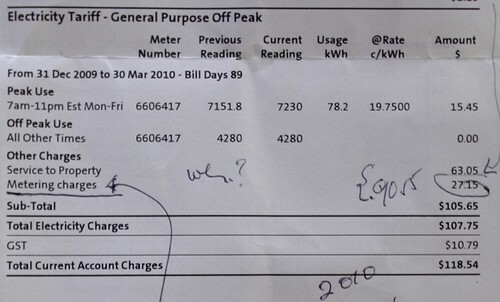 Anyone else being ripped off by their utility company like this? Your post is incorrect and should be updated. The rollout of smart meters in Victoria has not been put on hold. 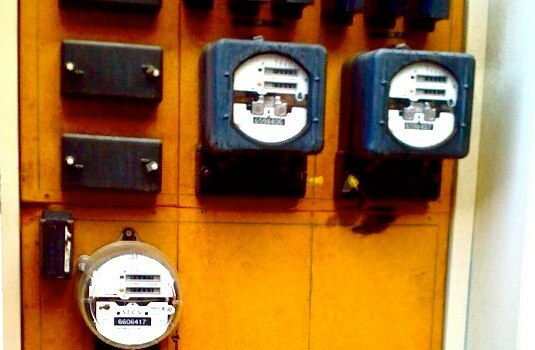 The electricity distribution companies must still have 5% of new meters deployed by June 2010, 10% deployed by December 2010, and 100% deployed by December 2013. Your father will still get a shiny new smart meter. What has been put on hold is Time of Use pricing. ToU pricing is where the price of electricity to the consumer can change over the course of a day, giving customers the option of shifting their electricity usage to low-demand times when the price is cheaper. If you have a complaint about being charged for your new smart meter, Origin Energy is not the right company to complain to. Origin is an electricity Retailer (they just send you your bill). The smart meter rollout is being done by the Distribution companies (SP AusNet, Powercor, Alinta, AGL, CitiPower), but don't complain to them either. The Distribution companies are compelled to conduct the rollout by the Department of Primary Industries (whose website you could have done some fact checking on). Thanks for your correction, which I've made. The real issue as far as I see it is one of trust. As you may agree, the smart meter (as far as it applies to us Victorians) is primarily a device to enable the utility company to charge us more for energy, through increased prices, time of use, critical peak pricing and higher fixed service fees. What I'd like to know is how can people trust the utility company (note, I'm fully versed on our industry's structure...) when we as the consumer are forced to pay for something way in advance of it's delivery? It's a little like the banks charging us $200 on our January statement for all the ATM transactions we may make at other banks facilities. As you rightly point out, as consumers there is nothing we can do about it who do we call? The only thing we can do is use less energy.